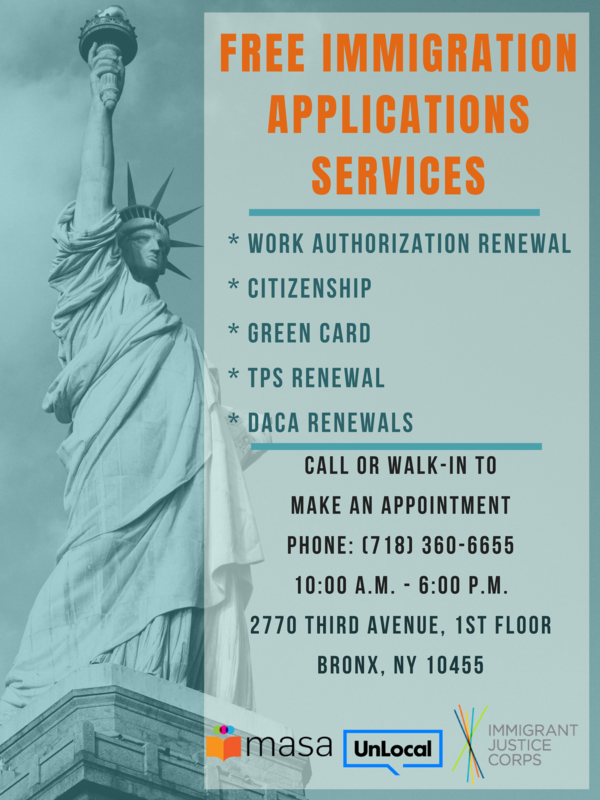 Free immigration legal intake and consultations with a representative by appointment only; Please schedule your appointment via email or phone using: katia@unlocal.org or (646)-216-8210. Consultations duration can range from 30-45 mins, depending on the number of people scheduled. First person will be seen at 10:00 a.m. ; Last person will be seen at 5:15 p.m. 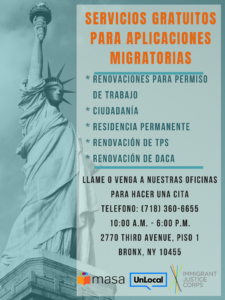 This location is not wheelchair friendly; however, if someone is interested in getting a free immigrant legal consultation we can accommodate, please call us at (646)- 216-8210 and ask for Katia. 6 train to 3 Ave. 138th St.
2 and 5 trains to 3 Ave. and 149 St.
Bx2 bus to 3 Ave. and 144 St.
Bx15 and Bx17 buses to Willis Ave. and 146 St.
Bx19 to E 149 St. and Bergen Ave.
Bx21 to 3 Ave and E 148 St.
Bx41 to Melrose Ave and E 150 St.
La duracion de las consultas puede variar de 30 minutos a 45 minutos, dependiendo de la cantidad de personas que hicieron citas. La primer consulta empieza a las 10:00p.m. ; la ultima consulta sera a las 5:15p.m. 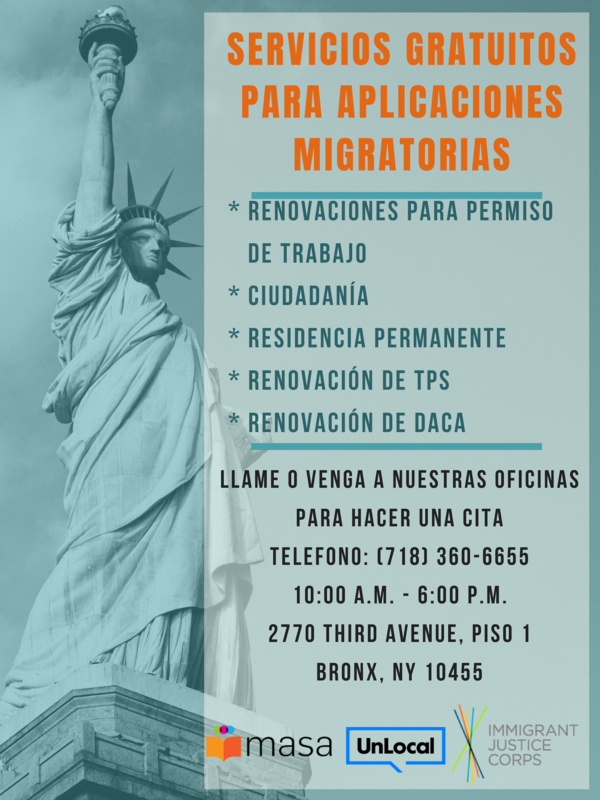 Este lugar no es accessible para sillas de ruedas; Sin embargo, si alguien esta interesado en obtener una consulta legal para inmigrantes sin costo, por favor llamaos a (646)-216-8210 y pregunta por Katia. El tren 6 para 3 Ave. y 138 St.
Los trenes 2 y 5 para 3 Ave. y 149 St.
El bus Bx2 para 3 Ave. y 144 St.
Los buses Bx15 y Bx17 para Willis Ave y 146 St.
El bus Bx19 para E 149 St. y Bergen Ave.
El bus Bx21 para 3 Ave. y E 148 St.
El bus Bx41 para Melrose Ave. y E 150 St.